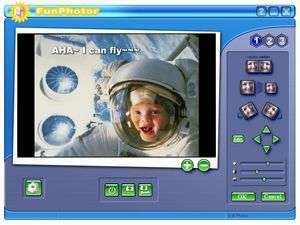 FunPhotor is a fun and wacky image editing program for warping and transforming photos in fun and exciting ways. Not for the serious photo editing junkie, this program is more for gags than anything. FunPhotor comes packed with many different templates for adding your face to weird and awkward premade photos. Whether you want your face pegged on SuperMan's body or you'd like to add you face to a U.
FunPhotor 6.2003 is a shareware program and can be used as a demo to try the software until the free trial period has ended. A full version of the program is available after the trial period ends. For security reasons, you should also check out the FunPhotor download at LO4D.com which includes virus and malware tests. Additional screenshots of this application download may be available, too.